Prevent the cracks in your driveway from spreading. 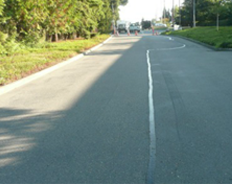 Our company in Everett, Washington, provides driveway crack repair that maintains that integrity of your pavement. What about the cracks in my driveway or parking lot? Cracks need immediate attention because they are your asphalt driveway’s worst enemy. Major problems result from a few cracks left unattended. While sealcoating is helpful, it does nothing for cracks larger than a hairline or larger. Actual cracks in the pavement require specialized crack sealant materials. Left alone, cracks allow moisture to penetrate the asphalt surface. Water expands as it freezes, breaking away small pieces of gravel. These cracks can be best fixed with a hot applied rubberized material that expands and contracts during temperature changes and weather conditions.